What is Anterior ankle impingement? Anterior ankle impingement, also known as anterior impingement syndrome, is a musculoskeletal condition where repetitive forces compress and damage the tissues at the front of the ankle, causing pain and stiffness. It is a common injury that can affect people of all ages, however is usually seen in athletes of sports involving repetitive or forceful upward movements of the ankle, such as sprinting, landing from long jump, uphill and downhill running. Pain at the front of the ankle is the primary symptom of anterior ankle impingement. This can be felt as an intense, sharp pain occurring with ankle movements or a dull ache in front of the ankle following periods of exercise. Pain can also be felt when putting weight through the ankle while standing, walking or running. Night-time aching, stiffness, swelling and reduced ankle flexibility are also common symptoms of anterior ankle impingement. 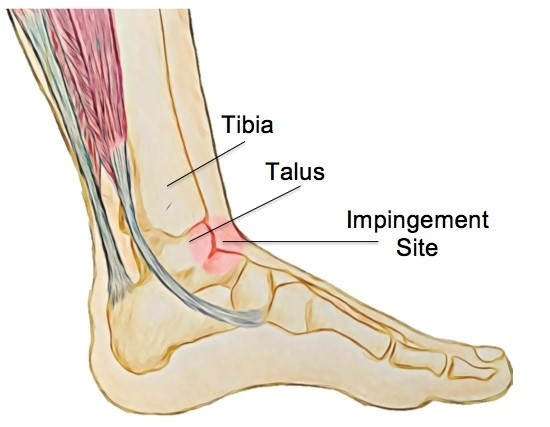 Anterior ankle impingement is caused by traumatic or repetitive compression to the structures at the front of the ankle as the tibia and talus move towards each other during ankle movements. The tissues that are affected become damaged and inflamed, causing the pain typical of ankle impingement. Chronic inflammation can lead to further stiffness, exacerbating the impingement process. The most common risk factor for ankle impingement is a previous ankle sprain that was not adequately rehabilitated, as this can result in a stiff or unstable ankle. Another cause of impingement is the growth of small osteophytes or bony spurs. These appear around the ankle joint and press against the nearby soft tissues. These can be due to osteoarthritis or grow as a reaction to impingement itself. Training errors, muscle tightness, unsupportive footwear and a hypermobile ankle have also been shown to be risk factors for anterior ankle impingement. Depending on the cause, mild cases of anterior ankle impingement usually recover in one to two weeks with rest and physiotherapy intervention. For more severe impingement, the ankle may require up to six weeks of rest and rehabilitation to recover. In rare cases, surgical intervention will be required to remove any physical causes of impingement. This includes osteophytes to restore impingement free movement of the ankle. Your physiotherapist will first identify the cause of your ankle impingement and help you to choose the best course of action to reduce your symptoms. They are able to advise you on the appropriate amount of rest and provide stretches and exercises to restore strength and flexibility to the ankle. Mobilisation techniques and range of motion exercises can also reduce stiffness of the ankle, restoring normal joint movement. Moreover, balance and proprioception exercises are included to prevent further ankle injury. Balance exercises challenge the way your body reacts to outside forces. With this, your balance will be improved, and you’ll have a more stable ankle. Ideally, physiotherapy treatment is the first step before considering surgery. If surgery is required, your physiotherapist can help you to make a full recovery with a post surgical rehabilitation program. Note: None of the information in this article is a replacement for proper medical advice. Always see a medical professional for advice on your individual condition.